Iran’s embattled Christian community is fleeing rising religious persecution, with hundreds securing refuge in the unlikely sanctuary of Bulgaria. Omid Salehi, 21, who converted with his family to Christianity 12 years ago, is typical of the religious refugees pouring out of the Islamic nation. Five members of his family fled first to Turkey, then made their way to Bulgaria, the former Soviet bloc country that lies across the Black Sea from Turkey and now enjoys European Union status. “My family changed from Muslim to Christian and when you convert it is so hard to live [in Iran],” said Salehi, who worked in an optics business in Iran and was introduced to Christianity by a friend who had converted from Islam to Christianity and took them to a prayer meeting at a Christian home. Iran’s regime carried out yet another wave of arrests in July, targeting Christians and leaders of the country’s struggling Home Church movement. Nikolai Chirpanliev, president of Bulgaria’s State Agency for Refugees, said the Iranian Christian community is growing in Sofia. Underground and home churches are a common way for Iranian Christians, particularly converts, to practice their faith away from the repressive eye of Iran’s security apparatus. Since Iran’s 1979 Islamic Revolution, Muslims who have converted to Christianity face the death penalty for apostasy. According to a recent UN report, as of January there are at least 49 Christians in Iranian jails for practicing their faith. Pastor Saeed Abedini, an American citizen, is one of them. He was sentenced to eight years in prison for practicing Christianity. Salehi said that for the past 12 years, because of their Christian faith, “all the time we have to worry about police cars and going to prison.” A friend was carted off to prison for being a Christian. 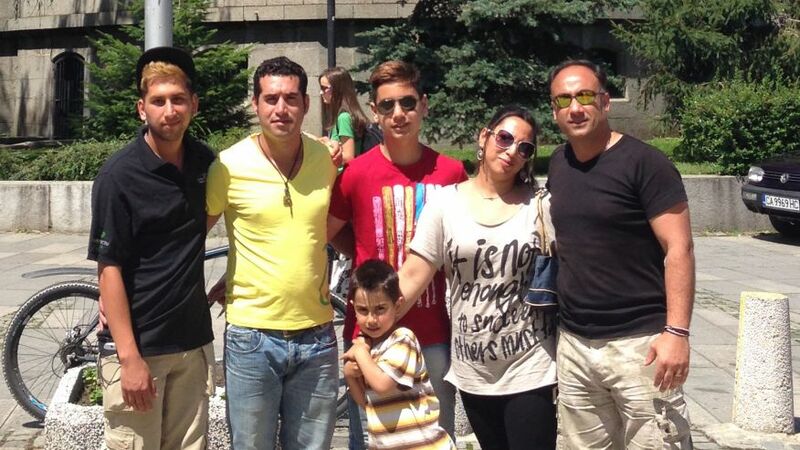 Omid’s mother, Nilofar Porkali; father, Hasan Salehi; brothers Arian Salehi and Adian Salehi and cousin Sayed Mahmud Ahmadi Organi are living with him in a Global Village Champions Foundation-owned residence on the outskirts of the Bulgarian capital, Sofia. The family fled the northeastern city of Esfarayen, which has a population of just more than 50,000. Hasan Salehi worked as a driver and mechanic in Esfarayen. Barry has gone to great lengths to provide lodging, medical care and social services to Christian, Sunni and Kurdish refugees fleeing Syria, Iraq and Iran. He has helped nearly 800 refugees by securing housing for the families in Bulgaria — the point of European entry for many from the Middle East escaping wars and persecution. Barry, who has been dubbed the “Jewish Schindler,” seeks to provide housing for 1,200 refugees. His goal is to match Oskar Schindler’s rescue of 1,200 Jews during the Holocaust. Although Iranian President Hassan Rouhani came into office professing to be a moderate, persecution of Christians has continued unabated, Salehi said. The U.S. and its partners in the P5+1 (Russia, China, France, the United Kingdom and Germany) provided Rouhani with a $500 million first installment of its frozen overseas assets in August. The money is part of a package of $2.8 billion designed to entice Iran to extend the nuclear talks to end its illicit nuclear program. The U.S. and several Western intelligence agencies believe Rouhani’s regime seeks to build nuclear weapons. Critics have long argued that Tehran also uses its oil and gas revenue to clamp down on religious and ethnic minorities. July saw the regime detain a leading Iranian pastor. Security forces arrested Pastor Matthias Haghnejad and church members Mohammad Roghangir and Surush Saraie, according to Christian media outlets. The three men are affiliated with a home-based organization called the Church of Iran. The latest crackdown on Pastor Haghnejad, who was imprisoned three times between 2006 and 2011, involved the removal of his Bible by security forces.